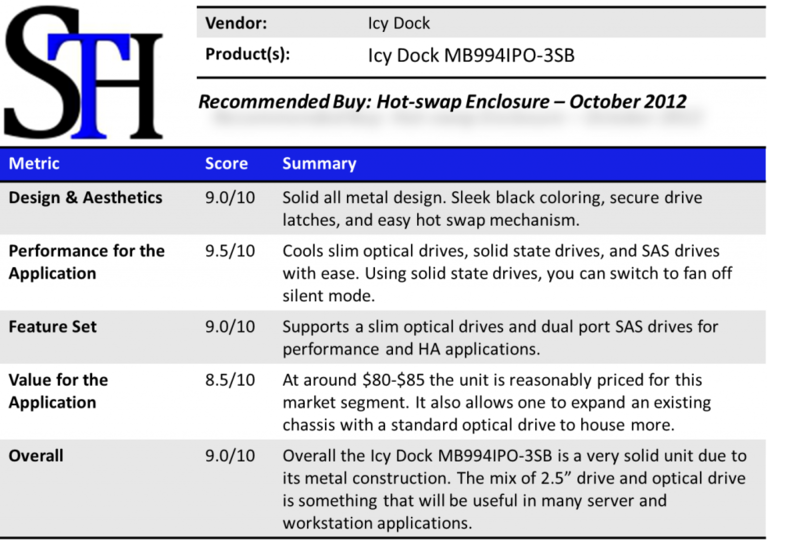 The Icy Dock MB994IPO-3SB is a really cool product. 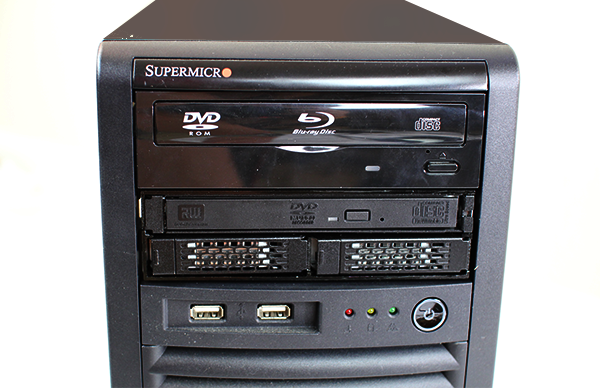 Here’s the basic idea – take a standard 5.25″ optical drive bay and make it more useful. Useful in the sense that it allows one to still use the 5.25″ space for an optical drive, but also allows one to add two 2.5″ SAS drives or SSDs in the same space. With notebooks being the primary market for the consumer space, slim optical drives are readily available and priced very reasonably. The 2.5″ form factor is gaining in popularity. 2.5″ is the typical SSD size and 2.5″ SAS drives tend to have better random I/O performance than their 3.5″ counterparts due to geometries. From a state of technology today perspective, the Icy Dock MB994IPO-3SB allows one to take advantage of new technology trends and make a standard server or workstation chassis more useful. Let’s take a look at the unit. For this review, we used a pedestal server platform, typical in the small business server space. Taking a look at the Icy Dock MB994IPO-3SB one thing becomes apparent, the enclosure is made of metal, not plastic. The slim optical bay occupies the top row of the enclosure. 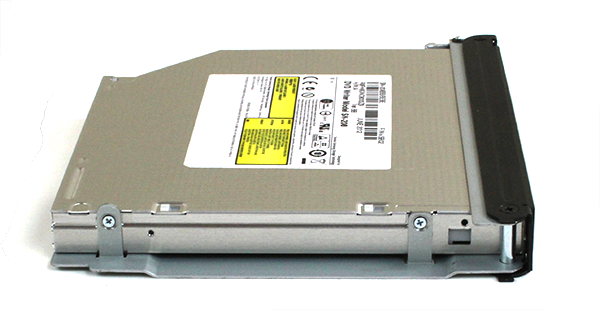 On the bottom, one can find the two hot-swap 2.5″ drive trays. Moving to the rear of the enclosure, the Icy Dock MB994IPO-3SB shows that it can be equally at home in a server as well as a workstation. The unit has dual 4-pin molex connectors. Most hot swap enclosures in this range have single power connectors, introducing a single point of failure. 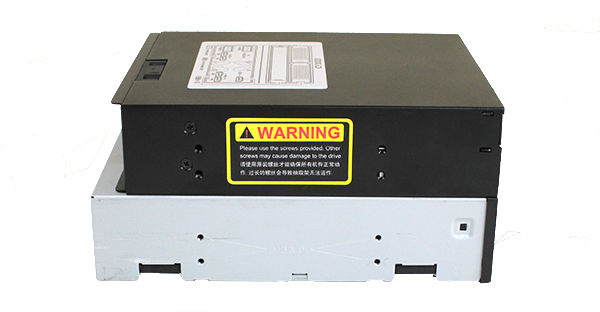 The next major feature we see is the optical disk drive (ODD) SATA connector corresponding to the top row position of the optical drive. The bottom row has four 7-pin SATA/ SAS connectors. For those wondering why there are four connectors, it is because many SAS drives come in dual port configurations. This is especially important when running high availability (HA) configurations. If one instead opts for simple configurations, like using standard SATA SSD in each tray, only one 7-pin connector per drive is required. Another feature of the Icy Dock MB994IPO-3SB is that it has an on/ off switch for the fan. Solid state drives run cool, so having the ability to turn off the fan for quiet computing will be an attractive option for some users.When the fan is off it seems as though heat, even when the drives are active, is dissipated enough through the metal enclosure. Moving to the trays, one can see that they are an all metal construction. Also, the 2.5″ hot swap drive trays have an EMI gasket. This is something missing from a lot of solutions out there these days. Taking a closer look at a 2.5″ hot swap drive tray, the all metal construction become apparent. I wanted to ensure that readers could see that the latching mechanism for the Icy Dock MB994IPO-3SB also was metal. It feels very solid. Drives are secured using the four underside screw holes. The optical drive uses four screws to secure it in place. I did want to point out that you do want a standard faceplate on the slim ODD with the Icy Dock MB994IPO-3SB. Many drives that are designed for specific notebooks will not work. My Samsung DVD burner had no issue and lined up nicely. I did want to take a second and remind users that the slim optical drives tend to use smaller screws than 2.5″ and 3.5″ drives. As a result, I had to switch to a small screwdriver to install the optical drive in the Icy Dock MB994IPO-3SB tray. Taking a look inside the Icy Dock MB994IPO-3SB shows off how difficult it is to light. In all seriousness, one can see two main PCB planes in the enclosure along with the power connectors, dual SAS connectors and mini SATA/ power connector. The PCB planes are parallel to the unit which helps airflow in the Icy Dock MB994IPO-3SB. After installing two SSDs and the Samsung slim DVD burner, one can see that the entire unit looks very sharp. The metal latches on the left side of the Icy Dock MB994IPO-3SB drive trays really look and feel solid. Prior to installing the unit, I did want to show depth. Some hot swap enclosures are very deep which can be a concern in cramped quarters. 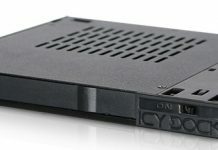 The Icy Dock MB994IPO-3SB was actually less deep than the full size 5.25″ DVD-RW optical drive I decided to replace. I installed the Icy Dock MB994IPO-3SB into a Supermicro SC731i chassis. The Supermicro SC731 is a mini tower meant to house mini ATX motherboards. 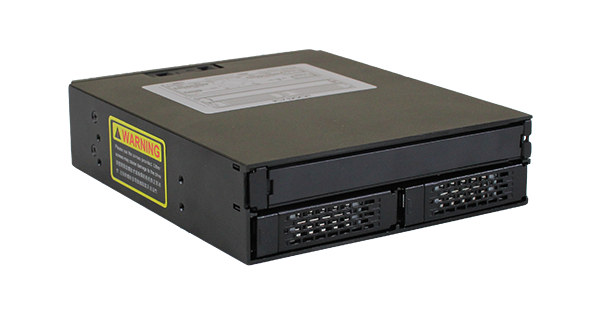 The chassis a a great choice for a pedestal server or a smaller workstation. It has four internal 3.5″ bays, but mounting 2.5″ drives can be difficult, and adding additional drives can also pose a challenge. With the Icy Dock MB994IPO-3SB one can have two dual port SAS drives or SSDs along with an optical drive in the 5.25″ space. This is much higher density than the optical drive above it and makes the unit much more useful. 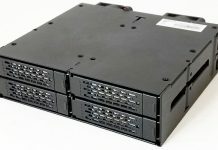 The Supermicro SC731 is also very quiet. With the Icy Dock MB994IPO-3SB fan set to off and solid state drives installed, it remains a quiet and cool server or workstation. One of the big benefits to a hot swap unit like the Icy Dock MB994IPO-3SB is the hot swap feature. If a drive fails, one can simply swap this out. Likewise, if one needs a CD drive (or wants to share an optical drive among several servers) they can quickly swap these drives in and out. Personally I recommend hot swap bays such as the Icy Dock MB994IPO-3SB in both workstation and server chassis just because it makes maintenance much easier. Overall, I was very impressed with the Icy Dock MB994IPO-3SB. This is one of those units that feels extremely solid with the all metal construction (save the electronics and fan.) It does have a slightly premium price at around $80-85 USD (not including the optical drive), but that is fairly standard. The latches did feel very solid which is excellent. The Icy Dock unit is a great option for those looking to expand capabilities in workstations and servers small and large. Just had to say that I appreciated this review. My case is full and I wanted to have the option for a pair of SSDs and remembered this article. Spent 15 mins to track it down so that I could find the model number. Yep, me too, I’ll write it down, thanks alot for the reviews. Thank you for the photos of the drive tray (sled) for the optical drive and view of the interior.